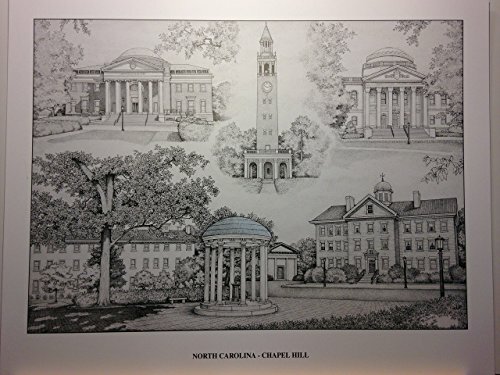 Limited edition 8"x10" size pen and ink print from hand-drawn original of the North Carolina's campus in Chapel Hill, NC. Includes scenes of the Wilson Library, Morehead Planetarium, Bell Tower, and a scene showing the Old Well with Old East and the South Building behind it; all notable landmarks on North Carolina's campus. Prints are from a limited run of 250 prints and are signed. Your purchase includes print, foam-core backing, and about-the-artist flyer within an acid-free packaging. Print can be purchased in the 8"x10" size, or in a larger 14"x18" size.